The Banu Hashims had barely begun to recover from the hardships of living in a mountain hide-out for three years, when Khadija, the wife, the friend and the companion of Muhammad, the Messenger of Allah, and the benefactress of Islam and the Muslims, fell ill and died. All her life Khadija had lived in the midst of luxury and abundance but the three years of exile had been a time of great hardships for her which inevitably took its toll. Khadija died on the 10th of Ramzan in the 10th year of the Proclamation of Islam. Khadija was the first woman in the whole world to declare that God was One, and Muhammad was His Messenger to all mankind. The honor of being the First Believer in the whole world is hers to all eternity. She had sacrificed her comfort, her wealth, and her home for Islam; and now it would appear that she paid the ultimate price with her life. Had she lived in her spacious and luxurious house in Mecca, Khadija might have lived for many more years. But she stood by her husband and his clan. During the siege, she had to endure not only the hunger and thirst but also the extremes of heat in summer and cold in winter, and yet no one ever heard a word of complain from her, and she never lost her composure. Whether times were good or bad, whether she had abundance or she had nothing, Khadija was always cheerful. Privation and hardships never soured her temperament. It was her cheerful temperament that was an unfailing source of strength, comfort and courage for her husband during the darkest moments of his life. From the moment of Islam's first call, until her death nine years later, Khadija never faltered. Whenever Muhammad encountered mockery or contradiction, he was sure, when he returned home in the evening, to find a cheerful and loving comforter. She was always ready by her confident equanimity to restore his courage and to lighten the burden of his fears. During the years of the siege, Khadija spent her immense wealth on buying essentials like water, food and clothing for the clan of her husband. When she returned to her house, her last dinar was gone; and when she died, there was not enough money in the house to buy a shroud. A cloak of her husband was used as a shroud for her, and she was given burial in it. Muhammad never married another woman as long as Khadija lived, and if she had not died, it is most probable that he would not have married any other woman. After her death, the Prophet Muhammad placed her in the rank of four perfect women, with the sister of Moses, the mother of Jesus, and Fatima, the best beloved of his daughters. Muhammad forever remembered Khadija with love, affection and gratitude. During her brief illness, he kept a night-long vigil, nursing her, comforting her and praying for her. He told her that God had built for her a palace of pearls in Paradise. Her death filled his heart with deep sorrow. Ibn Ishaq, the biographer of the Prophet, says that when there was resumption of Divine revelation after its cessation following the first revelation, Khadija received a Divine tribute and a salutation of peace from God. The message was communicated to Muhammad by Gabriel, and when he conveyed it to Khadija, she said: "God is Peace (as-Salam), and from Him is all Peace, and may peace be on Gabriel." One month after the death of Khadija, the Prophet received another shock in the death of Abu Talib, his uncle and guardian. Abu Talib was the saviour of Islam since its birth. The death of these two friends, Khadija and Abu Talib, was the greatest grief and sorrow that he had to endure in the fifty years of his life. He called the year of their death "The Year of Sorrow." The year 619 turned out to be a year of sorrow for Muhammad in more than one sense. Muhammed soon became sensible of the loss he had sustained in the death of Abu Talib who had been not merely an affectionate relative, but a steadfast and powerful protector, from his great influence in Mecca. At his death there was no one to check and counteract the hostilities of Abu Sufyan and Abu Jahl. 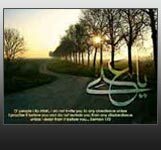 Abu Talib died some three years before he (Mohammed) migrated to Medina, and it was then that Quraysh began to treat him in an offensive way which they would not have dared to follow in his uncle's lifetime. A young lout actually threw dust on his head. The Prophet went into his house, and he was saying, "Quraysh never treated me thus while Abu Talib was alive." When Abu Talib felt that life was ebbing, he summoned his brethren, the sons of Abd al-Muttalib, around his bed, commended his nephew to their protection; and, relieved of the trust, died in peace, and was buried not far from Khadija's grave. Mohammed wept bitterly for his uncle; and not without reason. For forty years he had been his faithful friend - the prop of his childhood, the guardian of his youth, and in later life a tower of defense. So long as he survived, Mohammed needed not to fear violence or attack. But there was no strong hand now to protect him from his foes. They have insinuated that Abu Talib died in unbelief. If challenged to produce authority for such a statement, they would advert to Bukhari. Bukhari says that when Abu Talib was on his death-bed, the Apostle urged him to become a Muslim but he said that doing so would embarrass him with his Qurayshi friends. The authors of this tradition forgot one thing. Abu Talib was dying, and knew that he was not going to see his Qurayshi friends any more. At a moment like this he could not have cared less for the Quraysh. His anxiety at all times was to win the pleasure of Allah, and he proved by his deeds more than anyone else could ever prove by his words, that his faith in the Oneness of God, and in the mission of Muhammad as His Messenger, was unshakable. Abu Talib was a firm believer in Islam. His attachment to Islam is pointed up by his consistency, and by the logic of facts. No man can love Muhammad and idolatry at the same time. And no man can love Muhammad yet hate Islam. Whoever loves Muhammad, must, inevitably, love Islam. Nor can anyone hate Muhammad and love Islam. The sacrifices to which Abu Talib exposed himself and his family for the sake of his nephew, stamp his character as singularly noble and unselfish. If there is any one thing beyond any doubt in the history of Islam, it is the love of Abu Talib for Muhammad. Abu Talib and his wife, Fatima bint Asad, loved Muhammad more than they loved their own children. Such love could have had only one source, that of faith in Muhammad and Islam. Abu Talib's wife, Fatima bint Asad, the foster-mother of Muhammad, was the second woman to accept Islam, the first being Khadija. Abu Talib was proud that God had chosen Muhammad, the son of his brother, Abdullah, in all creation, to be His Last Messenger to mankind. Muhammad was the greatest love and the greatest pride of his uncle, Abu Talib. The are an integral part of the story of Islam. No story of Islam would either be complete or true if it did not account Abu Talib's glorious deeds, as the protector of Muhammad and the defender of Islam. May Allah bless His devout slaves, Khadija; Abu Talib and his wife, Fatima bint Asad.